KNOTTY BUT NICE! 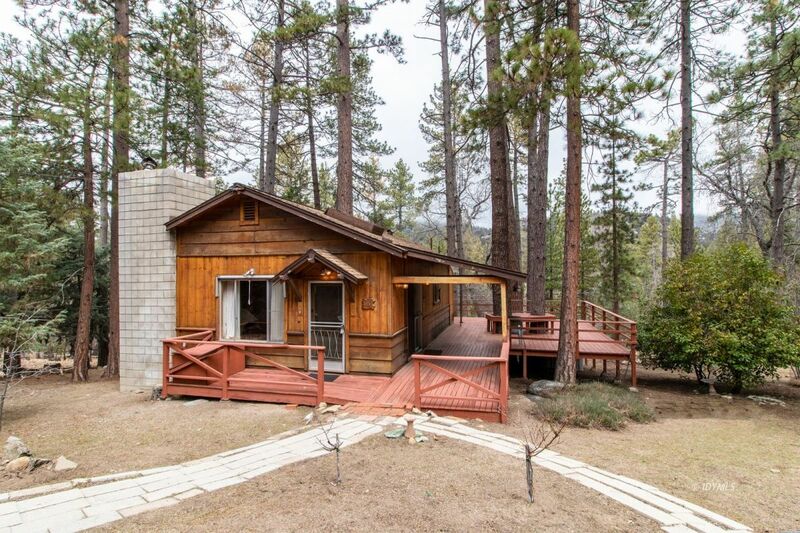 Charming 2 bedroom, 2 bath mountain cabin with detached garage, nestled on .46 acre, with views of Marion Mountain and walking distance to town. Easy street access to the cabin from garage and drive thru street parking area. The knotty pine interior adds to the "old Idyllwild " ambiance.. The living room has vaulted pine ceilings with sky lights that accent the floor to ceiling corner rock fireplace. The spacious country kitchen is off this area and offers many builtin features. There is a bedroom and bath on this level. The 2nd bedroom and family room are on the lower level. There is access from a tiny stairwell to this level in the hallway on the main level but it has it's own separate outside entrance. You will enjoy the spacious outdoor living that the wrap around decking offers. Pull up a chair and soak in the sun and views of Marion Mountain from this area. . NOTE: If you want more space, there is an additional .45 acre lot to the right of the cabin that is owned by this family and can be purchased separately.